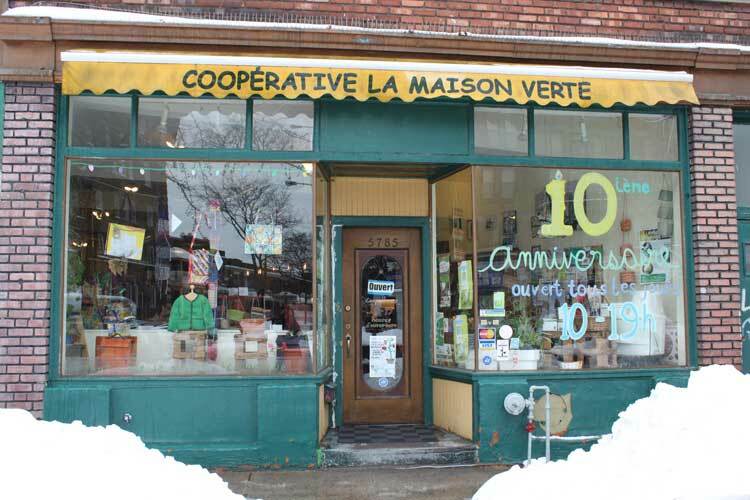 If you’re looking for fresh, local organic produce, you might want to pass by the Coop la Maison Verte in NDG one Thursday afternoon. 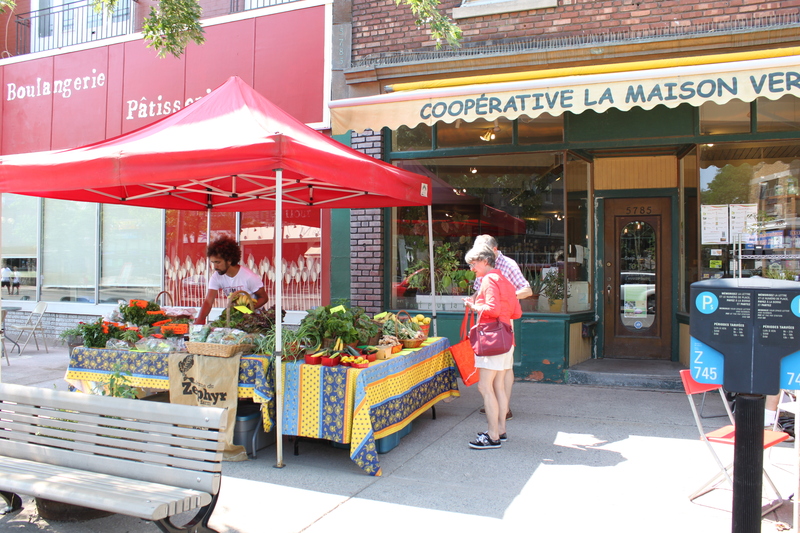 Throughout the summer, every Thursday from 3 to 7 pm, Ferme du Zéphyr sets up a market stand in front of the Coop, at 5785 Sherbrooke Street West, corner Melrose Avenue. If you live in Pointe-Claire, you can visit their stand at the Coop des Bons Voisins, at 247a Bord-du-Lac, every Tuesday from 3 to 7 pm. Ferme du Zéphyr is a certified organic vegetable farm located on the western end of Montreal Island, in the community of Senneville. On the day I passed by, Alex Godley was selling various kinds of lettuce and other greens, herbs, cucumbers and zucchini, most of it picked the previous day. The local vegetables were supplemented by organic bananas, lemons and ginger from elsewhere. Ferme du Zéphyr is also one of the farms offering weekly organic vegetable baskets, through the CSA (Community Supported Agriculture) program. It’s not too late to sign up. You can check out the Coop website for more information. 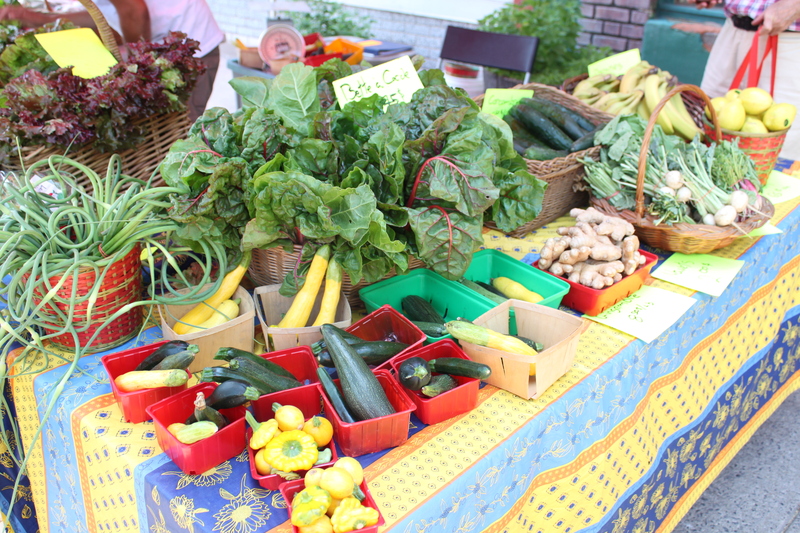 Or, see Equiterre’s website for a list of participating farms and drop-off points across Montreal. Finally, a friend of mine recently told me about the Lufa Farms rooftop greenhouse in Ahuntsic, which offers year-round organic baskets, with drop-offs at various locations. UPDATE (Dec. 2, 2011): Montreal Mayor Gérald Tremblay has announced that a public consultation on urban agriculture will be held this spring. The city clerk has confirmed that the petition meets the criteria for the right of initiative and contains 29,068 valid signatures. They did it. On November 15, 2011, the Work Group on Urban Agriculture (GTUA) announced that it had collected 25,082 signatures on a petition calling for public hearings on urban agriculture. This is well beyond the 15,000 signatures required to meet the City of Montreal’s criteria for launching a public consultation by right of initiative. In effect since January 1, 2010, the right of initiative allows citizens to initiate a public consultation on any matter that concerns the City or their borough. In the case of a City matter, the petition must be signed (on paper) by at least 15,000 people, ages 15 and over living on the territory of the city of Montreal, within a three-month period. The GTUA is the first group to successfully make use of this new tool. The GTUA hopes the City will mandate the Office de consultation publique de Montréal to begin public hearings soon. This would allow citizens and experts to express their points of view, and would help establish a profile of the state of urban agriculture in Montreal, the group explained in its Nov. 15 press release. On Dec. 2, 2o11, Montreal Mayor Gérald Tremblay announced that a public consultation on urban agriculture will be held this spring. The final count on the petition was 29,068 valid signatures. If the Work Group on Urban Agriculture can collect 15,000 signatures on its petition by November 8, 2011, the City will be obliged to hold a public consultation on the state of urban agriculture in Montreal. The group hopes such a public consultation would facilitate the development of urban agricultural projects, making the city a greener, more sustainable and more enjoyable place to live. 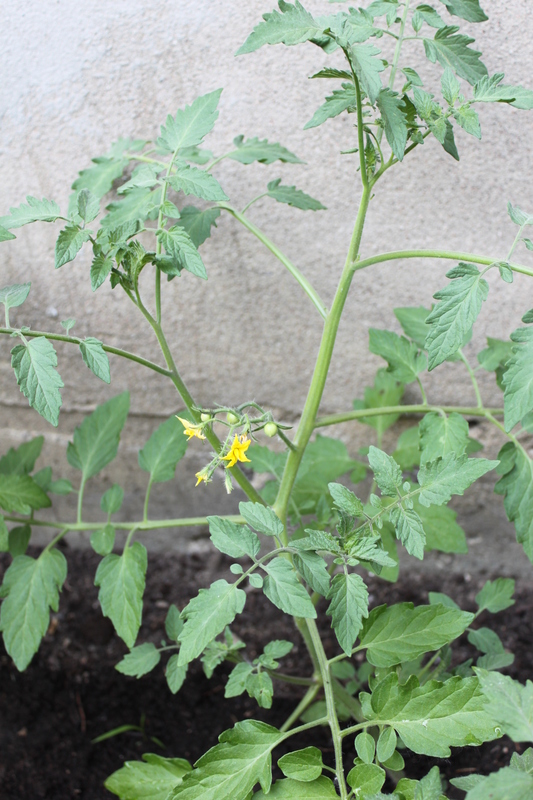 The Work Group on Urban Agriculture (or GTAU, for Groupe de travail en agriculture urbaine) is exercising the Right of Initiative, a tool in effect since January 1, 2010, that allows citizens to initiate a public consultation on any matter that concerns the City or their borough. In the case of a City matter, the petition must be signed by at least 15,000 people, ages 15 and over living on the territory of the city of Montreal, within a three-month period. Initially, the GTUA was composed of seven or eight organizations; today, a network of close to thirty organizations across the city is helping to promote and collect signatures for the petition. Projet Montréal also supports the initiative. Why a public consultation on urban agriculture? 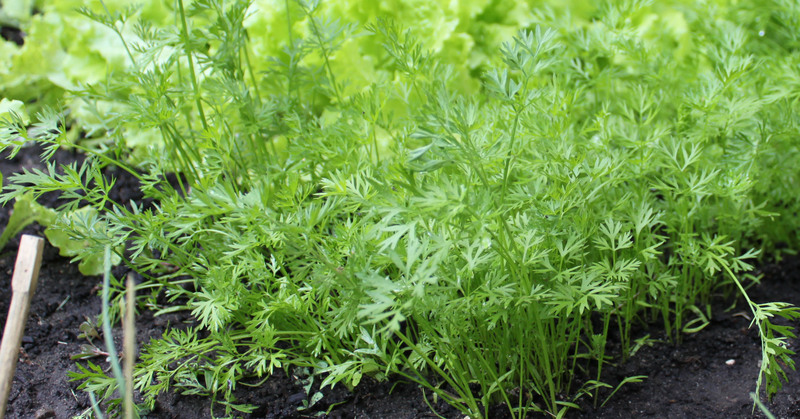 “At the moment, there are a great number of urban agriculture projects underway in Montreal, and new ones are continually being initiated,” said Voghel Robert. However, she said, these initiatives receive little recognition, and community groups struggle to obtain financing to keep their projects going. According to the GTAU, challenges to the development of urban agriculture include pressure on land use from development projects, the presence of contaminants in some soils, the absence of a strategy for urban agriculture, and a lack of availability of plots in the community gardens of central neighbourhoods. “Urban agriculture concerns everyone, even though most people probably don’t realize it,” said Voghel Robert. “How many people have flower boxes or herbs growing on their balconies? The idea is to put measures in place that will make things easier on a larger scale.” She adds that this isn’t a controversial issue, where people are being asked to put themselves on the front line. Only signatures on paper count. Consult the GTUA’s website for a list of organizations that have petition forms available for signing. Or, download the petition form, collect signatures in your neighbourhood, and then bring it to one of the participating organizations. For the latest developments, visit the Facebook page, Pour l’agriculture urbaine à Montréal. 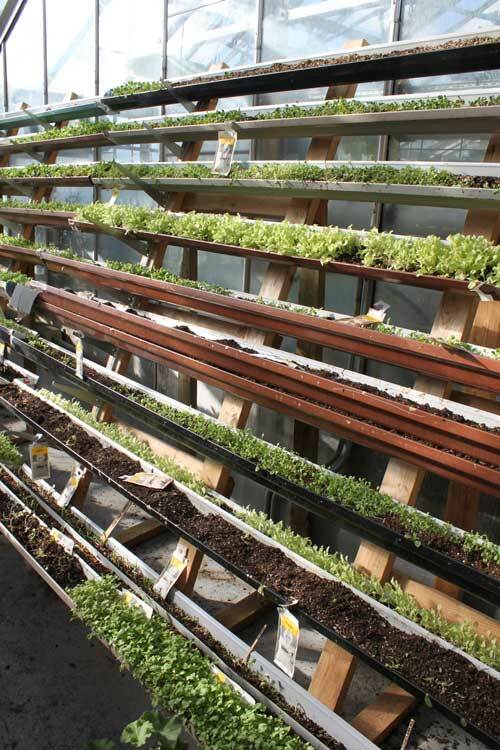 “Montreal urban agriculture blossoms despite red tape,” by Brennan Neill (OpenFile Montréal). Check out Columbia professor Dickson Despommier’s idea for vertical farming. 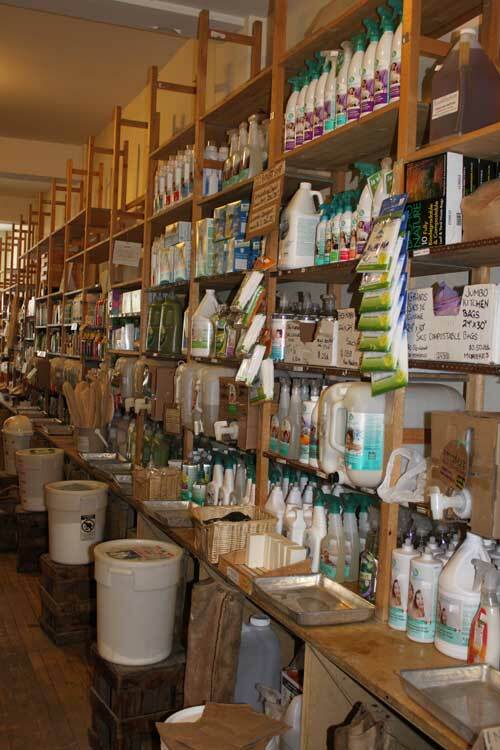 Lots of interesting urban agriculture projects in major U.S. cities. These may be some of the coldest days on record in Montreal, but one warm spot is Concordia University’s Rooftop Greenhouse, in the heart of downtown. Accessed from the 13th floor of the Henry F. Hall building on De Maisonneuve Boulevard, the greenhouse is a long and narrow construction that hugs the side of the building’s top floor. Sun was streaming in through the windows on the day I visited, and the air was heavy with that earthy, plant scent that I associate with Montreal’s Botanical Garden greenhouses. An initiative of Sustainable Concordia (a multi-stakeholder initiative seeking to create a more ecologically, socially and economically sustainable university community), the greenhouse is an all-organic space geared towards education and research, sustainable horticulture and community-building. “Everything in the greenhouse is a demonstration of urban agriculture,” explained Ruby Jean, a communications and women’s studies student, and the greenhouse’s communications coordinator, as she gave me a tour. Indeed, exciting projects are underway in each little room branching off from the main hallway. 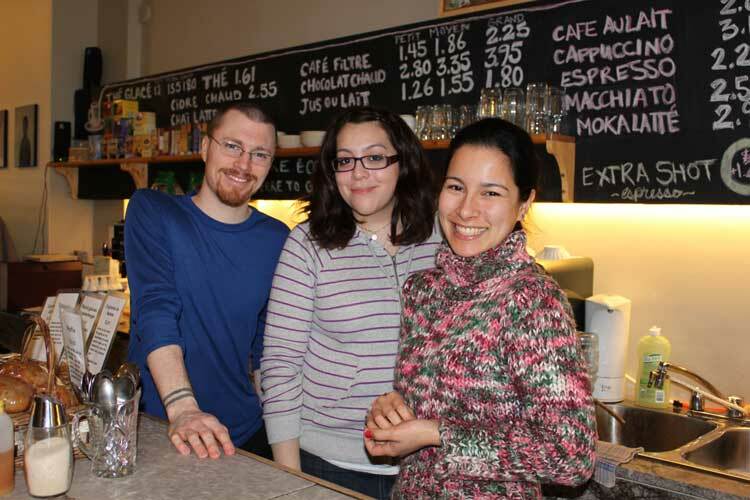 The Atrium is a community space used for workshops and events. Students are welcome to hang out in the Atrium any time, and can even brew themselves a cup of tea from some of the dried herbs from the tea project (see below). Tea project: in large plant boxes in the Atrium, all kinds of herbs are being grown to make tea; a dryer is also being built to dry the herbs. 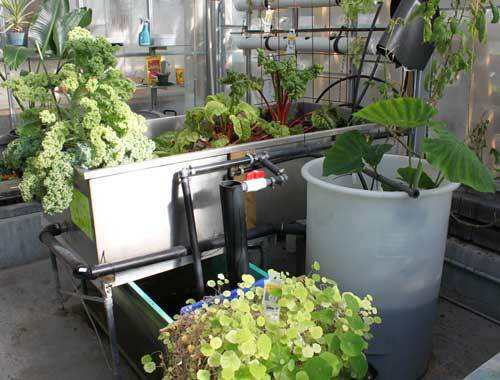 Aquaponics project: this is a self-sustained system for simultaneously cultivating plants and fish, while minimizing energy and water use. The fish excrement feeds the plants, and the plants feed the fish. People can eat the food being grown, but they can also eat the fish. This demo project uses goldfish, which no one plans to eat, but larger-scale installations often use tilapia. Lettuce project (microgreens): started a few years ago, this successful and lucrative project is run by Arlene Lynette Throness, a geography student and the greenhouse’s coordinator. Arlene grows the different varieties of lettuce using vertical planting (see photo) to maximize space, then sells the young, tender leaves to university cafés. 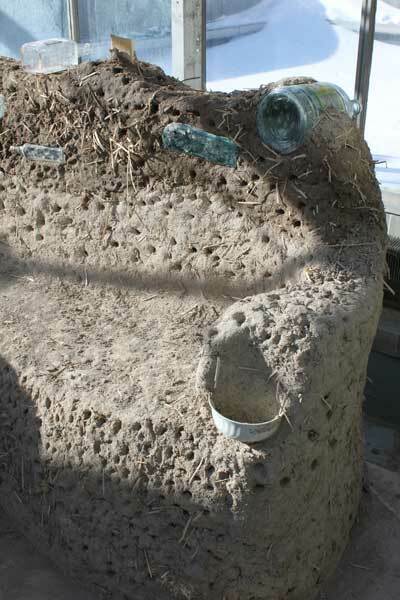 Vermicomposting: with this kind of composting, great for indoors, you feed your organic waste to earthworms. Workshops given by compost coordinator Noémie Messier-Guimont are highly popular; she also sells starter bins (containing earth + worms) to the public. Last year, the greenhouse gained publicity through its cooperation with Vert ta Ville, a group that aims to build a network of urban agriculture organizations on the Montreal Island through skill sharing and resource trading. In the spring of 2010, Vert ta Ville produced over 15,000 seedlings in the greenhouse, supplying more than 20 gardens throughout the city. Seedlings for 2011 will be started soon. 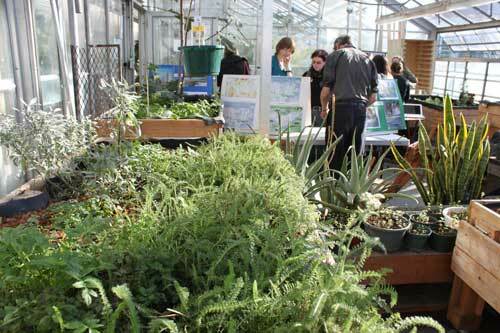 Admittedly, the Concordia greenhouse is not a demonstration of energy efficiency. That’s because it’s actually part of the building’s original structure (initially used by the biology and geography departments). When it fell into disuse and was slated to be torn down, Sustainable Concordia stepped in to the rescue. Thus the greenhouse has existed in its current form only since fall 2009. Last year, a wall was knocked out to create the student-friendly Atrium. Although the greenhouse has four part-time staffers, all the individual projects are run by volunteers—students, professors, or non-Concordia people interested in urban agriculture. Because of this, “the greenhouse is ever-changing,” said Ruby. The Atrium often houses workshops and events. Foreground: herbs from the tea project. Also in the Atrium is a cob bench, part of a project on natural building materials spearheaded by Stefanie Dimitrovas of the Montreal Permaculture Guild.